Hello Roxio community, i have been using Roxio for a number of years now and i was happy to find that my new Vaio has a preinstalled version of Roxio Easy Media Creator 10. The only problem is that my new Vaio was originally bought from Italy and everything installed, including Windows was of course, in Italian. I have managed to install a language pack for Windows, so that has been solved. But as im here, im now looking for help as to how i am able to change the language of my preinstalled Roxio Creator 10 without uninstalling it as it is a registered copy. Thankyou for any help, Rick. You got a 5 year old version of EMC 10 on a new computer? If you don't have the install discs then you are out of luck. What version of windows is on your computer? If W7 then EMC 10 will not run anyway. It was bought 2 years ago but never used up until i needed it, which is now. Vaio does not come with any installation or backup discs. Its running Windows 7 and yes, its working. I have burnt a data disc successfully. It will fail and crash. There have been numerous posts from people posting it was working then failed from one day to the next. On top of that if it came pre-installed it is most likely an OEM version which means it has some features missing, crippled or disabled. Most probably yes But i also have a laptop with Roxio 2009 Ultimate with all the trimmings, so really i only want the other to burn discs anyway. I just need to change the interface language to English. So your saying this is not possible? That change would need to be made when the software is installed. What kind of discs do you want to burn with "the other"? Video, music, data? I think im just going to do a complete uninstall of Roxio on my Vaio VPCJ11M1E and figure out another way around it. Thanks very much for your help. That's probably your best course of action. When Creator is installed in a language other than English, different files are installed. There are a series of .LOC files in the chosen language to take care of text displays in the program, plus a different set of graphic files replacing English menus. 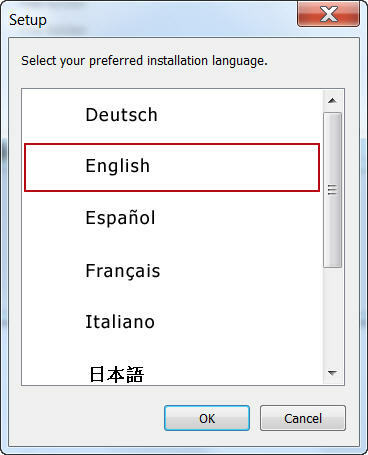 A reinstall is the only practical way to change languages in the suite after installation.